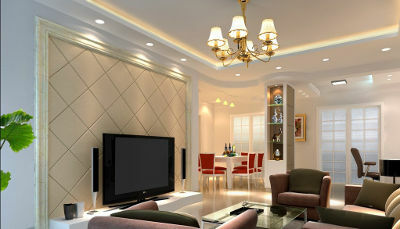 MASTER WIRE, INC is a great company to work with for all your lighting and electrical needs. We are a local, friendly and professional business that cares about its clients. We know and understand how important your home is for you and we assure that weʼll treat your home like ours. Proudly Chicago Electrical Licensed, insured and bonded, one of our goal is FIRE SAFETY for you, your home or office, providing complete professional inspections, and best solutions about electrical fire safety. MASTER WIRE provides perfect lighting solution for any space, room, home, office, store or any kind of commercial or industrial. 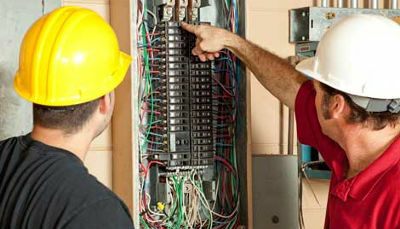 Our certified, trained electricians are knowledgeable and experienced, some with more than 20 years in this service industry. We believe that a strong and ethic customer service, combined with our complete professional service, is a winning combination for us and our clients. 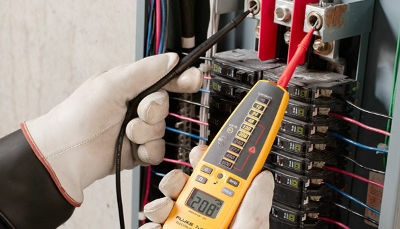 MASTER WIRE is always on schedule, no matter if it is an estimate appointment, or closing time for a project. Thatʼs why weʼve got a lot of appreciation from our clients, general contractors or entrepreneurs. Contact us for all your electrical/lighting needs! 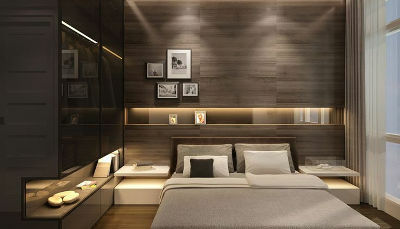 Ceiling dropped to create space for indirect lighting, millwork incorporates LED strip channels. All the light fixtures are new and all recessed lighting are LED retrofit trims. Undercabinet lights have been replaced with linear LED fixtures. All the lights are dimmable. Building Association and Engineering Conference Room. 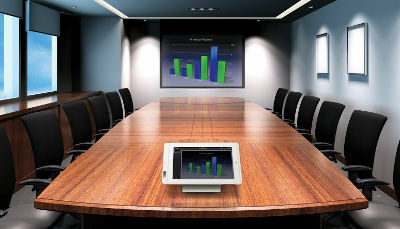 Newly installed a retractable screen projector and a retractable projector, wireless controlled. Loft Offices, newly created in an ex industrial space. 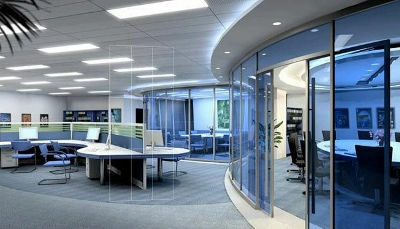 Direct and indirect lighting provided by Aculux Brand Lighting Systems, using exclusively LED as main lighting source. Offices Hallway/Gallery, newly renovated, replaced the old fluorescent 2x4 fixtures with 2x2 LED ones. Programable contactor controlled, after hours and in holidays, lights are off. 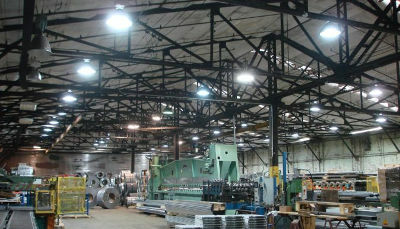 These high bay down lights fixture uses high efficiency LED bulbs 100 lumens/watt. Today, more and more of these type of fixtures are used in different areas like gyms in schools or public ones, cutting down energy consumption up to 60%. 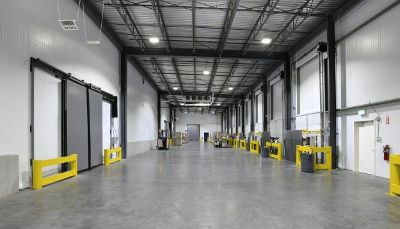 This warehouse is a garbage management company property, where 2xT8 fluorescent fixtures have been replaced with high efficiency LED T8 retrofit lamps. Newly high bay down lights fixtures have been repositioned accordingly with owner request. Next step, remove and recycle old shut off light fixtures. 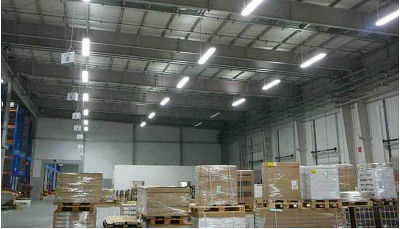 Warehouse upgraded to newly T8 LED retrofit in old T8 fixtures. 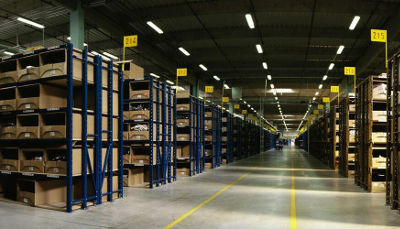 Cold storage warehouse, upgraded lighting to the newly LED high efficiency fixtures, that have no influence in temperature changing when theyʼre ON, like old sodium discharging lamps. This packing warehouse uses newly installed LED T8 high efficiency fixtures, providing a safety and healthy lighting, proven to alleviate workers fatigue and reducing working errors and safety accidents. 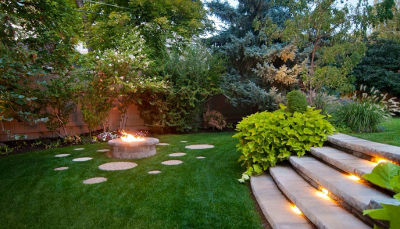 Landscaping controlled by photocell, flood lights for the pathway and accent up lights next to the home walls and entrance. Stairway down to the patio level controlled by photocell, sitting area and outdoor grill surrounding lighting, are manual controlled. 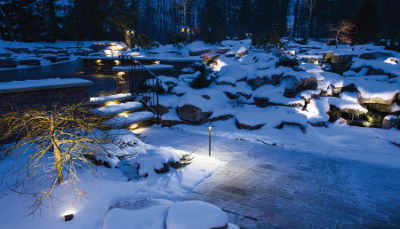 Combined landscaping lighting, pathway and accent lights, controlled by photocell, optional, manual over-controlled. Most people turn the landscape lighting off, during the winter, having no idea what gorgeous view can be seen starting at sunset. 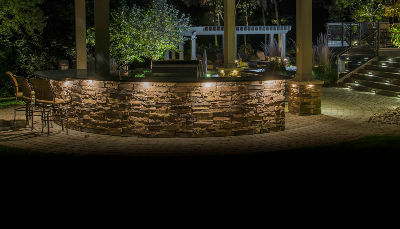 Back yard patio accessible by LED lighted stone stairs, photocell controlled. 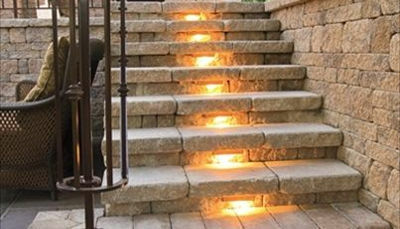 Double level patio, stairway lighting solution. 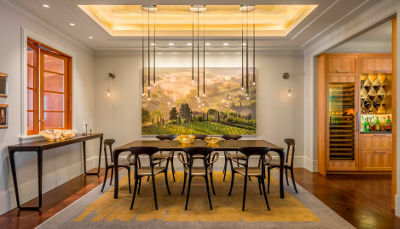 Lutron expands its control devices, to control almost everything in a residential, and right now, is the most affordable control center for any home or condo, controlling from a simple ceiling light or undercabinet lighting, to motorized shades and ambient temperature. Flood lighting and spot lighting now controllable from your phone using manual on/off, scheduled on/off, or automatic mode on/off using daylight sensors. All lighting fixtures must be dimmable. This device name is “Daylight Harvesting Sensor”. This combine “Occupancy Sensor” with “Photocell Sensor”. 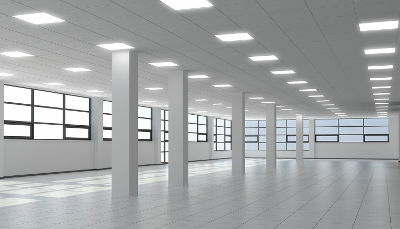 Keeping a specific brightness, adjusting lumens level, this device keeps the lights off in days when nobody is in the building. 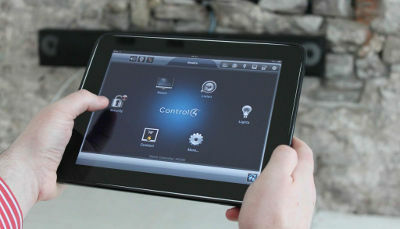 Talking about Lutron, this is the device that can complete control your house, condo or office. 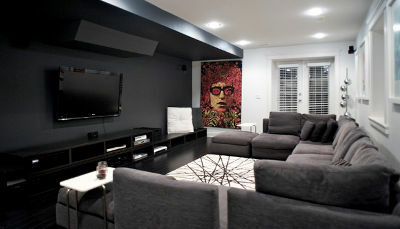 Starting from lighting, thermostats and motorized shades, to alarm system, audio surround system and security cameras. Compare with “Cassette Wireless” that starts from $500, “Control 4” starts from $5,000. But both systems are worthing, doing exactly what they say. Halogen and xenon in residential lighting provide a warm, outstanding spot lights or flood lights. But today, these are known that contribute to the Global Warming. Most of the people donʼt want to switch to LED, because they donʼt like the color (K). 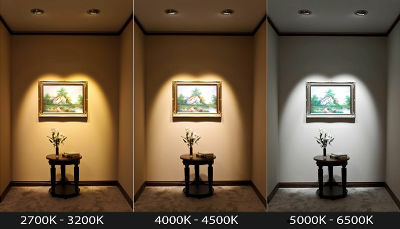 We can make a switch to LED possible, without K (temperature light) to be affected. Making our contribution to Saving The Earth. Residential, 9kW, just to back up: sum-pumps (2), AC unit, furnace, garage door and first floor lighting. Later we were called to add security system and internet modem and router. Fueled by residential gas line. Residential, 9kW, is backing up the essentials in this residence like: sum-pumps (2), AC unit, furnace, refrigerator, freezer, garage door and first floor lighting. Fueled by residential gas line. Residential, 22kW, is backing up the whole 100A electrical service. Fueled by residential gas line. Industrial, 175kW, replaced an old 150kW. Power upgraded for this industrial manufacture. Fueled by diesel. Industrial, 150kW, newly added to back up power for this industrial manufacture. Fueled by diesel. I was in an upstair office, when I saw my purchase going to the loading deck. 19 stories building, residential, run power from floor 12th to 4th, to designated parking space. Residential outdoor water proof charging system. Inside the garage, are other 2 EV with their own charging system. 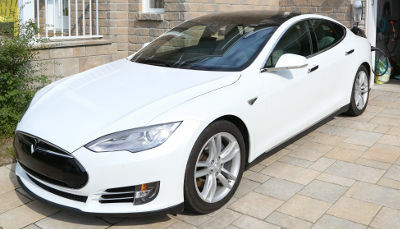 Multilevel public parking, commercial grade EV charger systems. 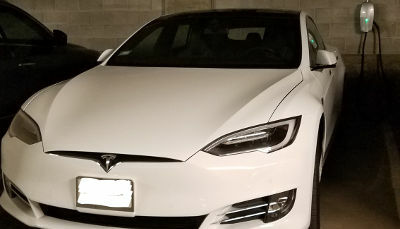 Residential indoor Tesla charging system. 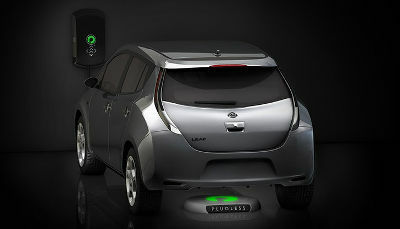 Newly wireless charging systems require underground power run to the charging pad. 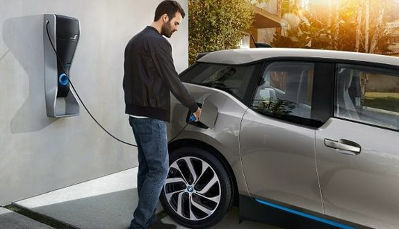 The newly BMW i3 Super Fast Charging System. Yes, we wire this one too. Bose speakers, surface mounted, with two incorporated sub woofers in mill work. This is a conference/presentation room in an offices building. 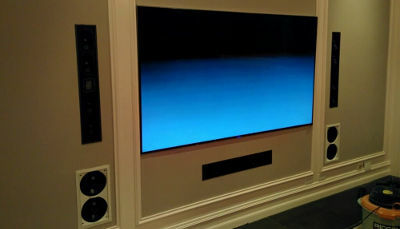 Lighting dim automated when TV is turned on. A master cable was run to the back of the room, for easy connection of a computer or laptop. 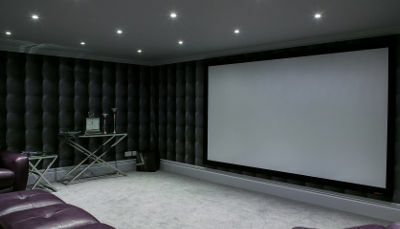 Entertainment with an Epson Cinema projector. All the speakers are behind insulation panels. Lighting by us, also. Single audio system that may be connected to the projector or TV. When one of them has audio on, the other one runs images on mute. 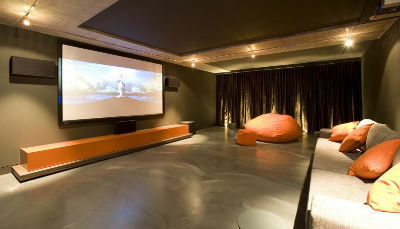 Multidirectional surface mounted speakers are the alternative to where recessed in wall/ ceiling speakers is not possible. 7 story building with 70 apartments electric vault room, in Evanstone, ILL. Electric Services: one of 6000A/1∅, and one of 200A/3∅. Upgrade residential electric service from 100A (abandoned one but later completely removed) to 200A. 6 apartments building electric service. 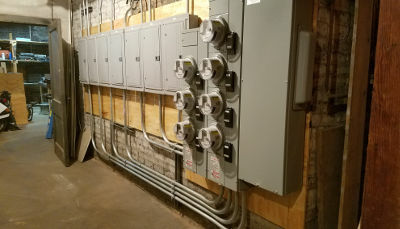 Old fuse boxes have been removed, to install new main disconnect, meters enclosure and new 100A each electric panels, 6 for apartments and one for public. High-school service and distribution vault room. 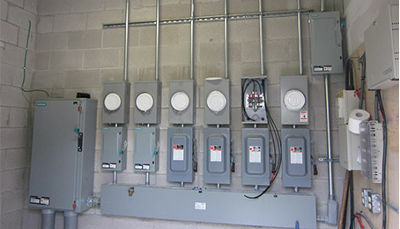 High voltage dry type transformers are installed for lighting, elevator, and 2 lab classrooms. Comed has replaced the slab ground transformer supplying power for 3 residences. New underground service lines replace the old ones. High-school, access to the labs corridor is made through keypad access or if rings, the person can be viewed in each lab classroom and access is possible granted from each lab classroom. 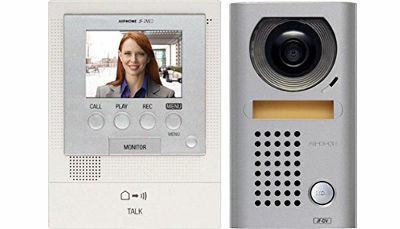 Audio/video communication with keyless entry system. Available for residential single or multiple families buildings, or commercials, including rear access for delivery. 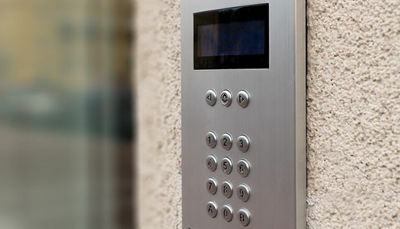 Audio/video communication with keypad entry system.Available for multi occupational buildings. 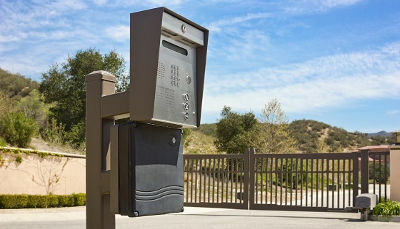 Residential, commercial or industrial plant access gate system with audio, keypad and keyless combination system. 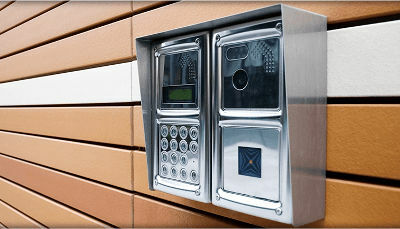 Waterproof digital intercom system audio/video, keyless entry and keypad combinations are available. This is the classic waterproof intercom panel that some manufacturers have discontinued production. We still have them in stock, for repairs, replace or new installation. Newly school entrance dome camera added, in addition to keypad access camera next to the entrance door, for a better view when space is crowded. Camera with warm movement sensor to record when senses movements only. Save energy and your storage capacity. Newly Lorex camera systems with its own app for androids and iphones, receive in real time images from entry door only or any other camera from the system. 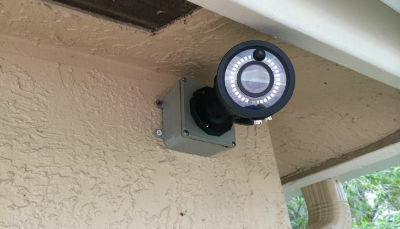 We can install a large variety of hidden cameras to cover your front/side or back yard, ground or high level, without intriguing any neighbors privacy, for your own security. 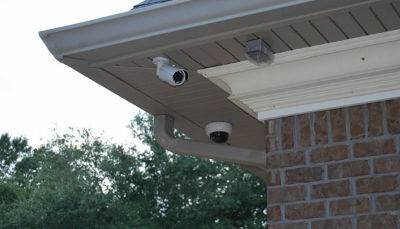 Combination of directional camera to limit surveillance along neighbors fence and dome camera for the front yard. Usually, a high resolution camera right above front entrance door, keep you safe more than you might think. Turning breaker one by one to verify with the directory label on front cover. Power panel and lighting panel is verified for directories accuracy. Automation lighting contact have voltage verified. 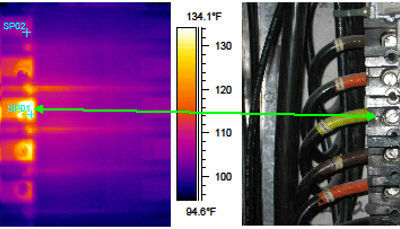 Inspection with a thermo-visual camera reveals a loose contact point. Inspecting 240V circuit contactor breaker. 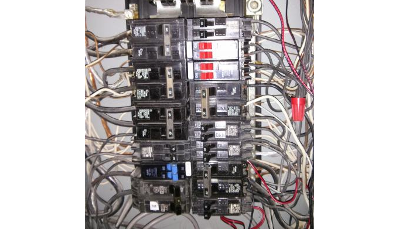 This is an electrician/inspector nightmare. In Chicago, this is one of the Code violation. 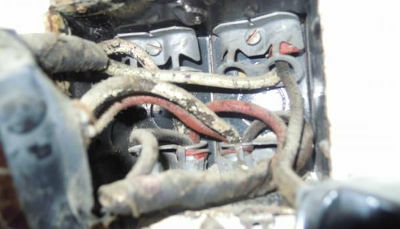 Old cloth insulation of these wires is the main request to replace them. This insulation doesnʼt resist to high temperature provided by a dimmer. Old cloth insulation damaged due to high temperature. This receptacle was used to plug in space heater. 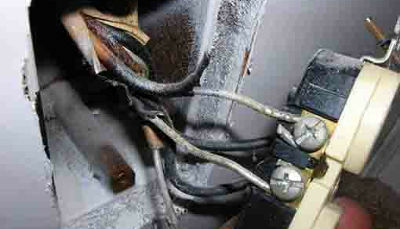 Cloth insulated wires, the main fire hazard in any home or commercial. Unprofessional installation damaged wiring insulation. Burned wires shall be replaced the entire lengths. Dimmers create a lot of heat in its box and old wiring have insulation rated less than 75 degrees that can be easily damaged. 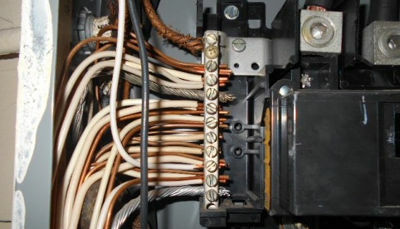 Obsolete Electrical Panel. Code violation. This is the name said by any inspector or professional grade electrician. Single breaker position with 2 toggle, are called in Chicago, “cheaters” and are not allowed in this city. This type of light bulb is going, going, gone. The newly LED light bulb doesnʼt create so many troubleshootings like incandescent ones. In case of power outage or partial outage we first check up voltage in the panel. In case of breaker tripping or fuse blown out we first check up amps in the panel. Another blown up fuse scenario is when you unplug a cord by the cord too many times. 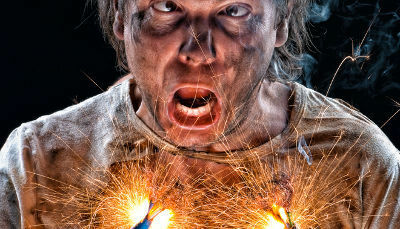 Another troubleshooting scenario is happening in DIY projects, when you try to do something electrical. This is the side effect of DIY. 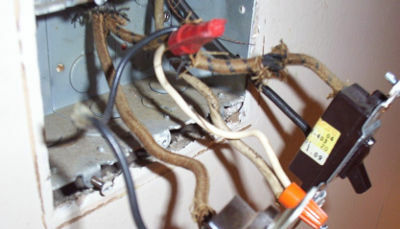 Bare wires need to be connected to a grounding buss bar. This connection, might create some harmonic currents in neutrals. That might turn on smoke detectors, printers or other sensitive electronics. I'm coming back to the Solar Panels Systems, but this time, for maintenance. I have an article about "going green", currently trending discussions in today's electrical field. Four years after installation, a client called us for some issues in the existing solar system - inefficiency. His Solar Panels were covered by some kind of sticky dust. This is Chicago's air. Dusty and polluted due to exhaust from high traffic, and winds that bring a lot of dirt and dust. This smog, covering all the installed solar panels in this city was the primary factor in reducing the amount of sunlight that fell on the solar panels. We can't change the air quality or the weather, but we can control the maintenance of these solar systems. Maintenance helps to ensure the best possible solar panel efficiency, regardless of what's happening outside. A system like this is not cheap. And I am not talking about the solar panels, but the electronic devices that assist and control harvesting energy, storage and consumption. Solar panels can work up to 30 years. But the biggest failure point is the inverter, that can last up to 10 years. In terms of capital investment, solar energy systems well pay back over the years by harvesting more energy and keeping a maximum peak performance at any time. Hire a professional solar panel cleaning for your solar panels. Don't try to save money by using your regular cleaning crew. Regular cleaning service can scratch the panel surface. Another good tip is to monitor module-level performance to see if any components are starting to fail. This way, you can avoid having your solar panels operating inefficiently for months or even years. When upgrading a solar system, investigate all the internal components and technologies of solar system options, rather than the final cost. Harvesting production versus the cost of ownership is the most important decision. Another hindrance to energy production for a solar system are the growing vegetation and trees. At the time the solar system was installed, there were no obstructions surrounding the panels, but in 2, 3 years, a tree might grow and shade some panel's surfaces. This blocking category is controllable compared to the clouds, that are not. To all Chicagoans with solar system in place, I wish you sunny days! April 2018 This month’s topic, is inspired by the current movement or theory to “Go Green”… (and I am not talking about painting yourself bright emerald for St. Patrick’s Day, okay?) The article chosen here is the Solar Photovoltaic Cell System. Definition for photovoltaics: a method for generating electric power by using solar cells to convert energy from the sun into a flow of electrons by the photovoltaic effect. Solar cells produce direct current electricity from sunlight which can be used to power equipment or to recharge a battery. A good thing is that we will have access to solar energy for as long as the sun is alive – another 6.5 billion years according to NASA. On the other hand, scientists have estimated that the sun itself will swallow Earth 5 billion years from now. That’s not our topic today. So, renewable energy, that’s the latest in all the conversations about how to save the planet. We know that during a day the sun sends 120,000 terawatts of solar radiation to the earth’s surface. This is 20,000 times more the power that is needed to supply the entire world for that day. This is the reason why our eyes look to the sky for all future energy producing companies. The advantages from this source are, renewable, abundant, sustainable, environmentally friendly (I need to talk about this later), good availability, reduced electricity costs, silent and require low maintenance. Talking about going green, is about producing energy with no impact on global warming, no toxic gases or fume residue - Just a clean energy product. But the solar power systems are far from being truly called “go green” for many reasons, starting from producing the photovoltaic cells panels, to recycling some parts of this solar power system. Before continuing, I want to explain the two main types of connections of these solar power systems: On Grid and Off Grid. On Grid, is most used for urban areas, where utility power is still connected as your main service. Comed, (in a Chicagoan case), should know about your upcoming solar power system. They install a 2-way meter in the same box you have your actual meter. During a day, your solar system produces power, that in the case nobody’s home, or less power is used than is produced, the extra power goes into the utility line. That is a credit for you, monitored by the new meter. That’s why I recommend this system to businesses that run during the day, and are closed at night, or for residences where homes are full of people all day long and have full benefit of their solar system. Off Grid, is mostly used on farms, in barns and agricultural buildings that are far from the utility lines. This system is more expensive because it requires a storage battery system for the energy produced during the day. A good thing is that human energy demand peaks in the middle of the day when there is a lot of sunlight, and less human energy demand during the night, when only the batteries provide the energy needed. Now that I cleared up the connections types, you should know that a solar power system is not for everyone. Your home (North Side of the Hemisphere) should have the length of the residence laying from East to West, or vice-versa. This way the longest part of your roof is facing South, where sun travels every day from East to West, and fits the most solar panels. Next, know that these systems are not cheap. This is the most debated aspect on the entire solar energy list. Like the rest of the world, US government provides incentives to every major energy production market - not just solar, to make the solar panels more affordable. Next, it’s good to know that this system provides power during the day, when the sun is up. At night, 0 power. So that’s why it’s a good idea to stay “on grid” connected, if you don’t have the space to build up a wall of storage batteries. Another aspect of these solar systems that is not a “go green” thing, is the recycling of used and aged solar panels. And this is a big issue, because in production of these panels, the materials used are expensive and very rare in nature. Thin-film solar cells are based on cadmium telluride (CdTe) or cooper indium gallium selenide (CIGS) that need special containers to recycle in. Also recycling storage batteries, used mostly are golf carts batteries 48volts, require a ‘not’ environmentally friendly process in order to be recycled. Solar power certainly is less polluting than fossil fuels. But manufacturing processes are associated with greenhouse gas emissions. Nitrogen trifluoride and sulfur hexafluoride has been traced in the production of solar panels. These gases have 1000 times the impact on global warming compared to carbon dioxide. Still solar power compares favorably with all other technologies producing energy. Bottom line, using sun energy is not a clean process that all of us were initially thinking. Production of solar panels, using solar power and recycling solar energy systems parts, are not at all clean processes. But technology, as I’m speaking, is constantly improving on the solar power industry. Innovation in nanotechnology and quantum physics has the potential to triple the electrical output of solar panels. Warranties are now between 20 to 25 years for today’s produced solar panels. Are you or anyone you know planning to “go green”? I have couple programs, on how to save energy right now, inside your residence or commercial. Being connected to the utility lines is a first step toward the concept of “go green”. Saving the energy, and next, searching for renewable energies options. Whatever plans or ideas you have, just email me at [email protected], and I will consult with you. March 2018 - 2018 is the mile stone in Chicago Electrical Code, over decades of small additions and changes made in each edition that came out yearly. Here is the decision made last September, that lead to the big time change in Chicago Electrical Code. Recommendation to update the Chicago Electrical Code (CEC) to the 2017 National Electrical Code (NEC), came from Judy Frydland, Commissioner, Department of Buildings. Until 2017, CEC was yearly updated with the new requests, but based on 1999 core version of NEC. The 2018 CEC, starts using previous year of core version of NEC, and modified many specific to Chicago requirements, like not so much metallic piping in remodeling and alterations, that was mandatory in residential and commercial buildings. NEC require usage of solid metallic tubing in commercial only, referring nation wide, because in residential is allowed to staple power cables along the studs, and pop the ends out for switches or receptacles. With the new code, future rewiring will require more cutting walls or ceilings. 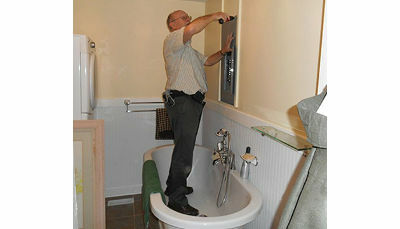 This will reducing electrical costs, but will increase costs of walls/ceilings repairing. Out of 50 states to which NEC address, Chicago (as city), New York (as state) and California, have their own Electrical Code, with more restrictions, personnel safety and most important, fire safety, but based on same year version of NEC. Thatʼs why greenfield (metallic flexible tubing) was allowed in Chicago no longer than 4ft with an extra green wire in it. Now is allowed 25ft, as it is in the NEC. I do see some savings in electrical services for residents, but safety? “New electrical code standards support sustainability, safety and savings for residents. The City Council today voted to adopt a major update to the Chicago Electrical Code, making Chicago one of the first major cities to align with the 2017 National Electrical Code. The new Electrical Code will bring additional energy efficiency to Chicagoʼs booming building industry, improve safety requirements and lower costs for residents and businesses. Reduced renovation construction costs through expanded use of flexible metal conduit for both residential and non-residential rehabilitation and other updates. 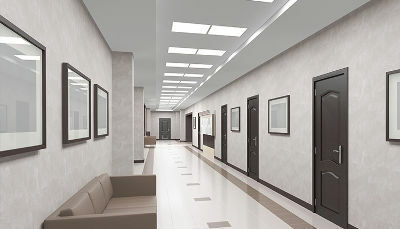 New lighting calculation methods and technologies that allow up to an 83% reduction in lighting design loads, which significantly lowers the cost of electrical installations in multi-family residential and commercial buildings as well as reduces electricity usage. Latest national standards for sustainable technology including solar power and other renewable energy installations and storage. Updated requirements for smoke and carbon monoxide detectors in new construction buildings. Provisions for health care facilities with to allow for enhanced technology and safety. Additionally, approximately half of the 156 articles in the National Electrical Code are being adopted with no local amendments, and many other articles are being adopted with only minor amendments. Retained in the proposed code are several requirements that have provided enhanced electrical safety in Chicago, notably strict requirements for the use of metal conduit and longstanding requirements on emergency lighting, emergency generators. "In 2015 we reinstated the city's Electrical Commission after a hiatus of 14 years specifically to study opportunities to update the Electrical Code," said Building Commissioner Judy Frydland. "I am grateful to all members of the Electrical Commission for their hard work and expertise. This code update clarifies requirements for state-of-the- art technologies which ultimately reduce the time for permitting and inspections, and save time and money for the building industry." Now, the materials inventory inside my van has being changed, based on new Chicago Electrical Code. The new 2018 Code is slightly thicker than previously versions having like 300 pages more. That is also because a Chicago Electrical Licensed Contractor should know National Electrical Code as well. Nationally, in the US, each state has a 3 hour exam, based on NEC, with 100 questions, in order to license an electrician in that state. 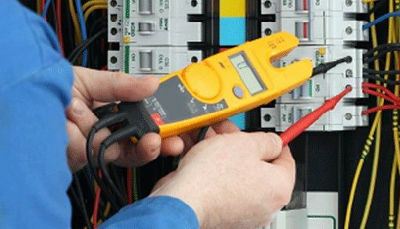 In Chicago, to be electrical licensed, you need to pass the exam answering 150 questions from CEC and NEC, in 4 hours. Many of them with calculations of: loads kilowatts, voltage drop, square/inches of wiring based on insulation thickness, luminosity, and ampacity. 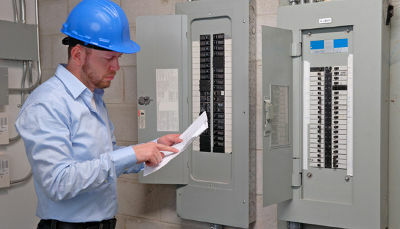 Passing this exam, you have the abilities to work as electrician in critical care facilities, clinics and any other facility where medical apparatus need to be connected, maintain or repaired, public buildings, commercial buildings, residential buildings, or, can apply for a City of Chicago Electrical Inspector. Last year when I tried to apply for this position, were 9 spots available, and a little bit over 300,000 applicants. Then, I realized how big is this ocean of people called Chicago. That was disarming. I just redirect my focus on my business. I spent almost a month updating with the new Code requirements, comparing with 2017 CEC chapter by chapter. Starting March 1st, 2018, any electrical inspection is made based on the new Code. If you had some failed inspections at the beginning of this year, just send me in couple words what the issues were, at [email protected], or just fill the contact form on masterwire.com, and I will consult with you. February 2018 - Itʼs been a disaster in Illinois and North-West Indiana, with so many properties under water, due to more than 16 days of precipitations. Not only flooded properties remain without electricity, but also, neighborhoods above flood levels. Com Ed here in Chicago and Nipsco in North-West Indiana cut power for whole area/neighborhoods where properties presented a risk of flooding. So, this month I will explore Residential Back Up Power Generators! Itʼs almost 15 years since, working for a big electrical company here in Chicago, I started my journey in the installation and setting up of Back Up Power Generators. Residential at the beginning, later, continuing with Commercial and Industrial. 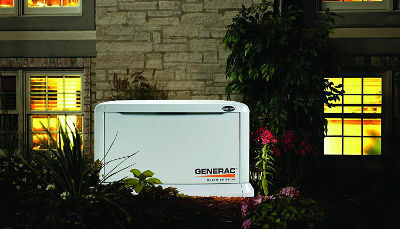 Right now, Residential Back Up Power Generator installation and set-up is routine. Actually, itʼs a little bit easier today than 15 years ago, because newer generations of generators have became much more hi-tech, with digital screens, and easier set up, with clearer instructions indicating each and every single wire to connect correctly. These generators, residential ones, could be ordered by the home owner, (if it is known what size is needed for that residence), or by my company. When I am solicited to give an estimate for a future generator installation, first thing that I need to know is how many circuits need to be backed up in case of power failure. Based on that info, I can calculate the size of the generator. Residential models can backed up from 9 kW, to 22 kW. In plain English, a 22 kW generator can back up a 100A electrical service, while a 9 kW could back up 6 to 8 circuits, depending on total amperage consumption of those circuits. For those who budged doesnʼt allow them to buy a back up for the whole service, minimum requirements by the Chicago Code are: basement sum-pumps, first floor lighting, furnace, AC unit, refrigerator, garage door, and security/alarm and internet. But every single home have a different power consumption, like an old refrigerator could use double the power of a new one, reducing the number of back up circuits. This is a minimum requirement for those that during a year, have couple or multiple power outage for their property, and ask for some back up. As I said in the title, recent flooding events, in and around Chicago area, made me choose this theme for Februaryʼs article. Except for other events on national TV, like the Olympics and arming teachers, the weather events prompted me to write, now thinking of some ex clients, and possible new ones, that plan to have a Back Up Gernerator in their back yard. The perfect Back Up Power Generator Project for me and every electrician, is when a client calls for an estimate, allows me to calculate the size of the generator, and knows their budged for this. 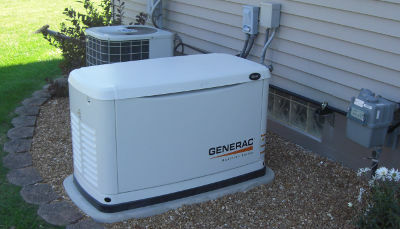 In case of approval, we book the time for installation, shop the generator(s), install it, set it up, and finalize the project. And now, other clients, that are not my favs, call me to install a Back Up Generator - A generator bought already by the home owner, and delivered to their back yard. I forgot to mention, that price for a 9kW, depending on brand, Generac or Kohler, might start a little bit over $2,000, while a 22kW, might starts little below $5,000. Coming back to the already bought generator; cheapest founded on market, and the client wants to back up the whole service. People who thought that having a permanently installed back up power generator to their home, could carry the whole home load. For these people, my question is: Why do these generator manufacturers specify the range, residential are: 9kW, 11kW, 16kW, 20kW and 22kW? 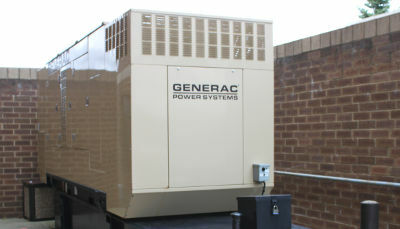 And they do not specify, One Size Fits All Residential Generators? Like, “ This generator is for residential only!” Wouldnʼt that be nice? 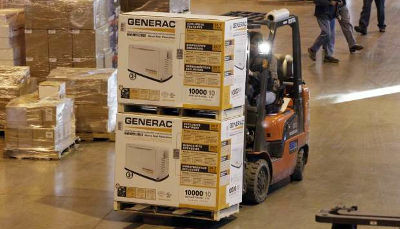 Anyway, the point here is that what they bought doesn't match with what they needed or wanted, they have to return the generator and buy the right one if possible, or just install what is bought, and connect the minimum circuits possible to that Back Up Power Generator. First thing, contact me to set up an appointment and discuss about load calculation, best location for the generator, what circuits are needed to be backed up, what materials must be used, and of course, labor. I forgot to mention that all residential generators are fueled by the home gas line. Next thing, I send you an accurate estimate for the whole project. After approval only, I send my concrete crew to prepare the surface and pour a solid/thick concrete slab to support the generator. 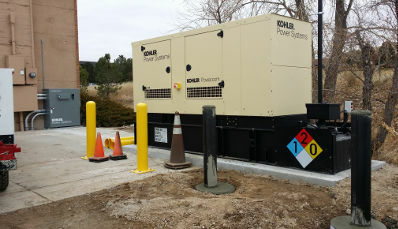 After concrete is solidly dry, I bring the generator, fasten it on the concrete slab, connect it to the gas line. In most cases, where is possible, I like to go underground to the home, to keep a clear surrounding for the generator, (see above photo gallery for “BackUp Power Generators”). After installation, we shut the main service disconnect off a couple of times, to see if generator will start up accordingly with the manufacturers settings. Then, accordingly with the home owner, we set up the weekly 12/5 minutes maintenance running for the generator, options are: daily, weekly, monthly, but for a good maintenance and using less gas, I like to set up weekly, (9kW and 11kW exercise 12min, 16kW, 20kW and 22kW run for 5 minute). Some people want it Sunday at 9am, to be ready on the deck and watch the generator starting up and running. Some other prefer not to hear it, and set up maintenance on Thursday (for example) at 11am, when no one is home. Excluding concrete pouring and drying process, a total estimative time from bringing the generator until last checking/setting up, it might be done in one day for a small generator, and a short distance to the home, and up to 3 days for the biggest one and a long distance to the home. Next I register your address to a specialized company in maintenance and service of the Back Up Generator. Hoping that shed some light over something that for some might be rocket science, by clearing the air around these Residential BackUp Power Generators! January 2018 - Have You Ever Had Problems With Your Electronics and/or Appliances Working Properly After a Thunderstorm or Heavy Rain with Electrical Discharges in the Air? !...Because lighting strikes could seriously damage the sensitive controls of these devices. Letʼs begin with your Electrical Service - the outdoor part where you have that round ComEd meter, installed in a metallic box. 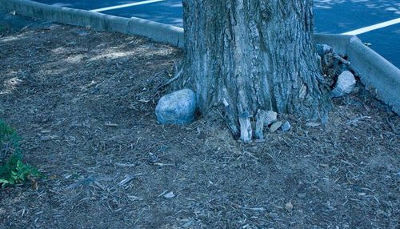 Right there, it should be your first grounding point. From that box, a pipe going down to the ground, and right there, a bare conductor connected to a rod, coming out from the ground, and of course an aluminum grey label that says “Do Not Disconnect”. You got the picture, never ever disconnect that conductor! The main function for that rod is to keep safe your home, including everything you have plugged into power outlets. Why? Because, in case of a storm, when a lightning strikes a transformer on the alley post, the high voltage wave goes into ground, not into your service panel keeping all the appliances and devices safe. Close to your Electrical Service, is Comcast or AT&T cabling, coming down on the wall, going at some point into your home. Along the way, this cable is grounded. There are small clamps, anchored on the wall, and bonded to the service metal pipe at some points. This way, they safety secured the cable. 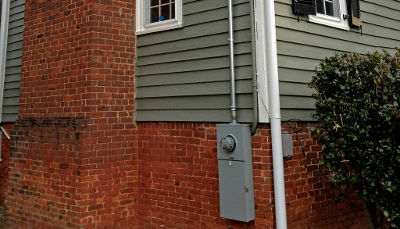 Going back to my story, I found that some tuckpointing was done outside that building on Lincoln Avenue, and someone disconnected those grounds, left them loose, leaving a nice repaired brick wall. The Comcast cable was left with the grounding clamps loose. The lightning struck that cable, and the high voltage wave ran into the house, reaching out to the Comcast box, ran through its power cable into the multiple outlets were other devices were plugged in, and thus, they burned out. The wave reached the outlet, and ran to the panel where a second grounding was in place. Then, it disappeared into the ground. The obvious question is: Why didnʼt the surge protector trip and protect those devices? When you buy a surge protector, is for the safety of what you plan to plug in, right? Well, here is how a surge protector works: That red, yellow or orange LED button is right between the cord, that goes into a wall receptacle, with the protected receptacles lined up. So, anything plugged into that surge protector is protected from any power fluctuation coming from your outlet, from Comed in our case. But when a fluctuation of current is coming from one of the protected outlets of surge protector, as in my above story, the surge protector doesnʼt do anything. It save you one way - from the wall receptacle. Not from whatever is coming from the back. Itʼs just like the traffic; one way traffic has indicators facing the way cars are coming, so they can proceed driving safely. When a vehicle is approaching the wrong way, speeding up, imagine the mess. This is happening to devices plugged in the surge protector when a high voltage is coming from one of the cords plugged into that surge protector. Because is January, I would like to say to all of my readers, and all Chicagoans, A VERRY HAPPPY NEW YEAAAR!!! For a limited time, I will keep a flat fee of $100, for every grounding checking visit. Or just email me questions and I will answer. So, as you see, I put a price on your safety. Is it too much, too less, you decide! So you have multiple means to contact me, if you have a similar concern. Good luck everyone finding good deals on electronics!!! But before plugging them in, and you donʼt know where to look for proper grounding, Email me me first! December 2017 - Wireless security cameras, wireless lighting controls, all other things control from your phone, out of control, hacked, or not hacked,...yet! As today, most people just realize that is less than a week until Christmas, and the Holidays Spirit is in the air. 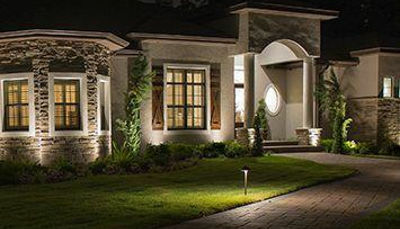 Others, have different concerns like: their own home security, home internet security, smart phone internet security, or some wireless outdoor security cameras, or wireless lighting controls, or climate control for the home. Most of the wireless, labeled as Do It Yourself (DIY) items, are made for easy installation, with easy steps to install and set up a wireless product. You donʼt call a professional for that,(see my September published blog). I will be short on wireless security cameras. If it is security, it should be something solid, something consistent, with a professional looking. 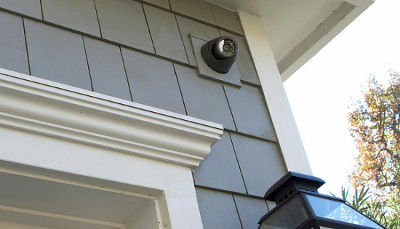 Some “security wireless cameras” can be open from outside, by anybody with a ladder, and might take the battery out or completely remove the camera. I do not recommend these cameras because of this, and many other reasons. First of all - the batteries: Not all rechargeable batteries are compatible, and others, last one day, or in most happy cases, one week. And in these frigid winter temperatures, you must go outside, climb the ladder, unscrew the security cover, replace the batteries, put the cover back on, make sure you didnʼt move the camera, then go back inside and start setting it up, hopeful that all the cameras are working.... THEN remembering to do it all again in a couple days, for the next 2 months of winter, over and over again. Iʼm not trying to amplify the chore you gift yourself with, but a simple fact that for me - these cameras are “adult toy” grade - far from a security class, that you may think you have. And this is not the only issue. More problems occur to these cameras. It happens to some new clients, or other contractorʼs clients. Scenarios include: people watching TV in their living room, in the evening, and lights turned on, off, or start dimming themselves; Another one, people waking up in the middle of the night to a frigid temperature, and the lights are on throughout the house; Another one, people didnʼt find the history in their time video recording, or all images are the same, even if it happened that you cut the grass, or delivery of boxes, or people in and out of the front door, but nothing is recorded in your history; Another one, the Christmas inflatables, and lights, or lasers, are controlled by a Bluetooth device, from your phone, that turned off just a couple of minutes after you turned them on, or when you know that they are off, and they surprisingly, turned back on. What happened? In an episode, “Ross Investigate”, three months ago, he explained and proved how easy it is to hack a Bluetooth device from outside, to any Bluetooth device in your home, just with a smart phone, and he explained how to avoid these kind of problems. Another issue was how to hack a wireless camera, an outdoor or indoor one, from outside, using an app on a smart phone, and how you can stand in front of it, and make it record the yesterday time lap; even a kid with a smart phone can do it, and how a situation like this can be avoided. A good hacker can sit in their car, and using an outdoor or indoor wireless camera frequency, close to the window one, can reach your router. And from there, depending on your security settings, can access your phone, control your lights, or temperature throughout your home. If you have indoors cameras also, just imagine the mess. Generally speaking, I recommend 2 security cameras (not necessary to specify “hard wired” ok? ), one front and one back of the house, which can be installed in one day. Just assume another day for the walls/ceilings repairs. AND THATʼS IT. No other hassles changing the batteries, or other issues associated. I am estimating the number of days, 2 maybe 3, but my professional suggestion is to go with hard wired security cameras. Until next time, please take care of yourself! Happy New Year! Please Email me if you met similar or different scenarios with hacked wireless stuff. It happens in some preexisting recessed low voltage fixtures, not very old ones, but it happens. Most of the LED MR-16 bulbs are not compatible with all the transformers existing in your recessed cans, because the brighter they are, the more power these bulbs need. All generations until today, of low voltage recessed can lights, have transformers capable to power up incandescent bulbs, halogen bulbs or xenon bulbs. 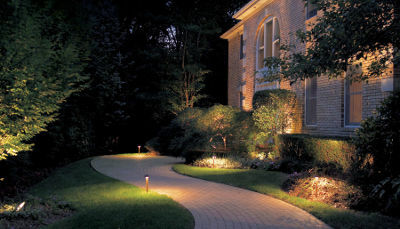 All brands of low voltage recessed can lights, require 12V bulbs. Thatʼs because this is the transformer rating, 12V transformer. At a closer look at the digital voltmeter, secondary of one of these transformers are 11.5V, or 11.6V, or 11.8V. The point is that none of these existing transformers deliver exactly 12V. Why? Because it doesnʼt matter to xenon, halogen or incandescent bulbs! They light up very well. By the time LED showed up as a better lighting version than CFL, in reducing Global Warming, the low voltage recessed can light manufacturers, started installing a new transformer that delivers 12.0V, 12.3V or 12.5V, to be compatible with the new LED bulbs requirements. And, as of today, everyone is involved more or less in Saving Energy Programs, Going Green, and all kind of stuff, thus switching to LED. But, switching to LED requires a little bit of attention. Compatibility is first thing you have to look after. 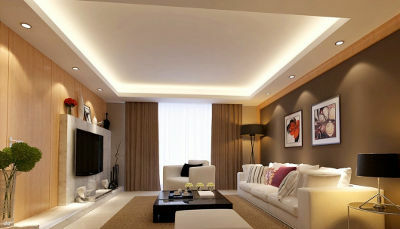 Dimmable is another feature that you should look for in case your existing lighting is on dimmers. All new MR-16, 12V bulbs have info on the box, regarding compatibility, or if they are dimmable or not. If your low voltage recessed fixtures has been installed in 2014 or closer to today, you might be able to have good standing lighting in your home, with new LED MR-16 bulbs. But in any case, it is a good idea to save the boxes, to keep a track of what you bought, or to return them in case you donʼt have solid, consistent lighting as you wish. Good luck everyone switching to LEDs!!! Please Email me if you have or had a similar scenario! Your ceiling light doesnʼt provide enough light for your kitchen, or it looks so old, and you just want to switch to LED lighting. You saw in the store how bright these light fixtures are with LED bulbs, and you decided to get one, from the store, or online, and to replace it all by yourself. You turn the switch off, and replace the old fixture with the new one, and when you turn the switch back on, surprise.... it does not work. What happened? I connected white with white, and black with black, exactly like the old lamp was wire connected. What went wrong? Let me tell you this: the new LED light fixture requires a good grounding. 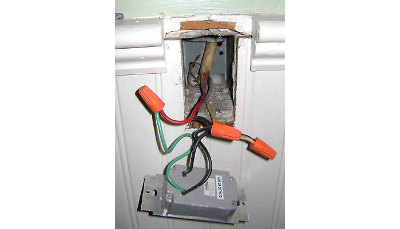 You might say, so what, I live in Chicago, and all the electric wiring is in metallic tubing and a good grounding exists at every single electrical outlet, ceiling box, switch box, receptacle box, and so on. All right, all right! That is true, and regarding at old light fixtures, they do have a metallic base, or canopy, screwed on that metallic box, providing a perfect grounding for the whole lamp. 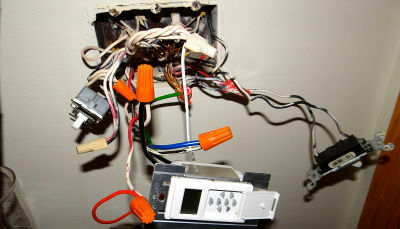 But until today, working in Chicago, you didnʼt pay attention to that bare or green insulated wire that came connected to the fixture. And most of the newly LED light fixtures, are made all from plastic, to not create a magnetic field inside the lamp, affecting functionality of that tiny LED bulb. 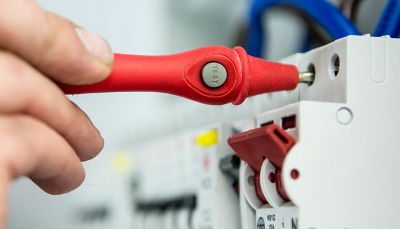 Now, if you screw this lamp to the existing metallic box, without connecting lampʼs green wire to the box, or to a green wire inside the box, the lamp fixture simply will not turn on. And that is the little secret for the all new LED lamp fixtures, in order to make them work. My suggestion is to contact a professional electrician when you plan to do even some minor electrical changes, like switching to LED lighting, anywhere in your home or office, because some unpleasant surprises might just turn up! Or just Email me, I never mind getting another job!!! All the big box retail stores today have a department with electronics where you are tempted to buy something to “smarter” your home. And just to list a few, SmartThings, Z- Wave or Wink. They came up with plug-ins stuff, controlled by remote, your phoneʼs bluetooth, or wireless connected to a hub that you connected to your router. With the app downloaded, you can control that receptacle, from home, the work place or when youʼre on vacation. That receptacle might feed a TV, a floor or table lamp, or an audio system or speaker. Sometime, just to control all these when you are away, to create an impression that somebody is home, or just for comfort. Either way, you will end up buying more stuff linked to the initial purchase, just to create a multiple controls throughout your home. I am writing this now, because more and more homeowners put themselves in a fire hazard, without knowing it. More than a year ago, I attended a seminar about New Fire Hazards in Homes, where I learned that those hooverboards, even when theyʼre not on the charger, could just ignite themselves, and start a fire by just being in hot environment, like in a garage during the summer. If you donʼt have cars in garage, you might have other things stored in there that could burn up. And City of Chicago, Buildings Department and Fire Fighters Department, after numerous cases,(a house or a 2, 3 story building yesterday, and today, a straight ground level site), decided to create this seminar, listing all starting fire hazards involved in these cases. And hooverboards were not the only issue here, all these smart things or smart lighting controls that homeowners have installed in their home, were another one. National Fire Protection Association (NFPA), National Electrical Code (NEC), and Chicago Electrical Code, are very specific regarding electrical safety to all licensed electricians: every device, fixture or appliance, TO BE UL LISTED. What does that mean? Any device that needs to be plugged in a receptacle, or to control a light, needs to have that UL in a circle on the box, meaning that this device have passed all U.S. fire tests, an institution nationally recognized. Some lighting control devices become hot in the electrical enclosures where are installed, and when you have old wiring, that is the perfect fire hazard. Recently I was call for an electrical project in a nice condo, and the homeowner just handed me a bunch of boxes with smart lighting controls, smart dimming controls, Asian made stuff. I had to excuse myself, because I am not licensed to install something that you bought it to DIY. As a professional, I suggested them Lutron to them, because I am authorized installer for different lighting, motorized shades and temperature control systems provided by this well-known company. I provided catalogs with these energy saving programs that I am involved with. But I am not to install any kind of devices from China, just because you saw it on TV, or in a big box store display, if it is not UL listed. And this is the thing with the DIY. I believe that this is the new trick of convincing people to spend some money, convincing anyone that is easy to do it. Anyway, I might be wrong, but this is my professional opinion. Until next time, please take care of yourself! 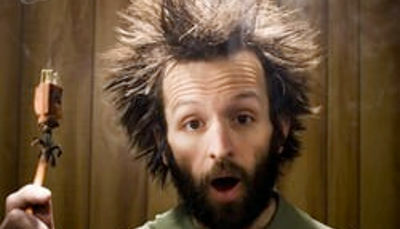 Email me, please, if you met similar or different scenarios with DIY electrical related products.